Leah Hogsten | The Salt Lake Tribune Faith leaders l-r Rev. Curtis Price with The First Baptist Church of Salt Lake City, Rev. Monica Dobbins with the First Unitarian Church of Salt Lake City, Zen Buddhist Anna Zumwalt and Pastor David Nichols with Mt. Tabor Lutheran Church demonstrate in opposition to SB96 outside the Utah House chambers, Feb. 8, 2019. Leah Hogsten | The Salt Lake Tribune Faith leaders l-r Rev. Curtis Price with The First Baptist Church of Salt Lake City, Rev. Monica Dobbins with the First Unitarian Church of Salt Lake City, Zen Buddhist Anna Zumwalt and Pastor David Nichols with Mt. Tabor Lutheran Church demonstrate in opposition to SB96 outside the Utah House chambers, Feb. 8, 2019. Leah Hogsten | The Salt Lake Tribune Faith leaders r-l Rev. Curtis Price with The First Baptist Church of Salt Lake City, Rev. Monica Dobbins with the First Unitarian Church of Salt Lake City, Zen Buddhist Anna Zumwalt and Pastor David Nichols with Mt. Tabor Lutheran Church demonstrate in opposition to SB96 outside the Utah House chambers, Feb. 8, 2019. Leah Hogsten | The Salt Lake Tribune Faith leaders l-r Rev. Curtis Price with The First Baptist Church of Salt Lake City, Rev. Monica Dobbins with the First Unitarian Church of Salt Lake City, Zen Buddhist Anna Zumwalt and Pastor David Nichols with Mt. Tabor Lutheran Church demonstrate in opposition to SB96 outside the Utah House chambers, Feb. 8, 2019. Leah Hogsten | The Salt Lake Tribune Faith leaders l-r Rev. Curtis Price with The First Baptist Church of Salt Lake City and Rev. Monica Dobbins with the First Unitarian Church of Salt Lake City recite scripture and sing in opposition to SB96 outside the Utah House chambers, Feb. 8, 2019. Leah Hogsten | The Salt Lake Tribune Faith leaders l-r Rev. Curtis Price with The First Baptist Church of Salt Lake City, Rev. Monica Dobbins with the First Unitarian Church of Salt Lake City, Zen Buddhist Anna Zumwalt and Pastor David Nichols with Mt. Tabor Lutheran Church demonstrate in opposition to SB96 outside the Utah House chambers, Feb. 8, 2019. Leah Hogsten | The Salt Lake Tribune Pastor David Nichols with Mt. Tabor Lutheran Church demonstrates in opposition to SB96 outside the Utah House chambers, Feb. 8, 2019. 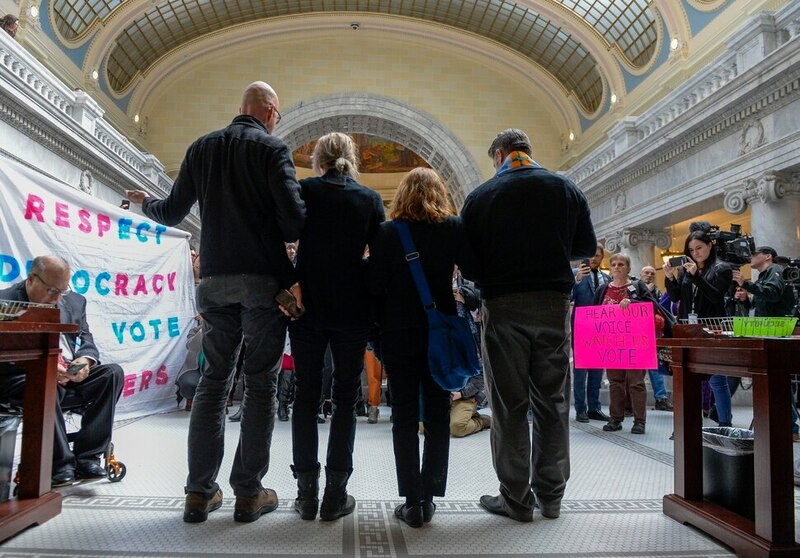 Leah Hogsten | The Salt Lake Tribune Zen Buddhist Anna Zumwalt chants with faith leaders in opposition to SB96 outside the Utah House chambers, Feb. 8, 2019. 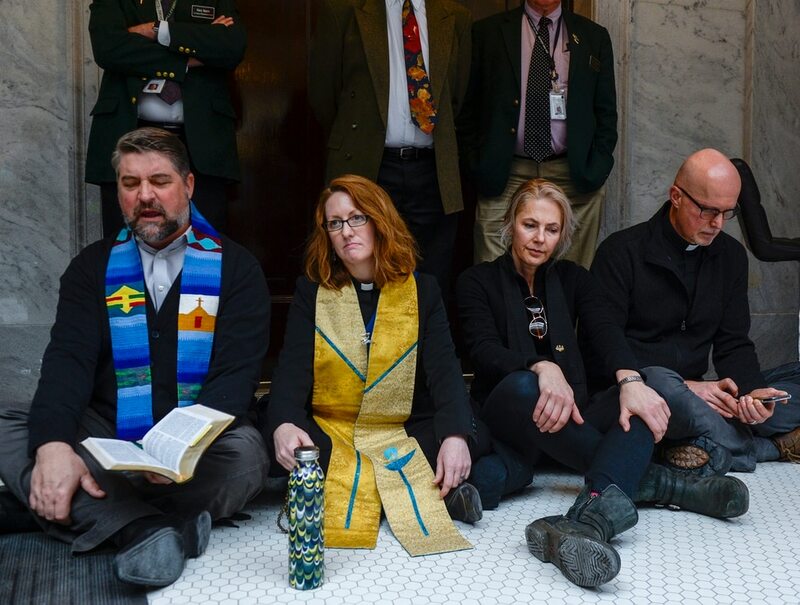 Leah Hogsten | The Salt Lake Tribune Melanie Hopkinson of Holladay joined faith leaders and fellow citizens in opposition to SB96 outside the House chamber, Feb. 8, 2019. Leah Hogsten | The Salt Lake Tribune l-r Ellie Brownstein, who is in opposition to SB96 and Wiz Rouzard with Americans for Prosperity in favor of SB96 debate for and against in front of the Utah House chamber, Feb. 8, 2019. Leah Hogsten | The Salt Lake Tribune Faith leaders l-r Rev. Curtis Price with The First Baptist Church of Salt Lake City, Rev. Monica Dobbins with the First Unitarian Church of Salt Lake City, Zen Buddhist Anna Zumwalt and Pastor David Nichols with Mt. Tabor Lutheran Church demonstrate in opposition to SB96 outside the Utah House chambers, Feb. 8, 2019. 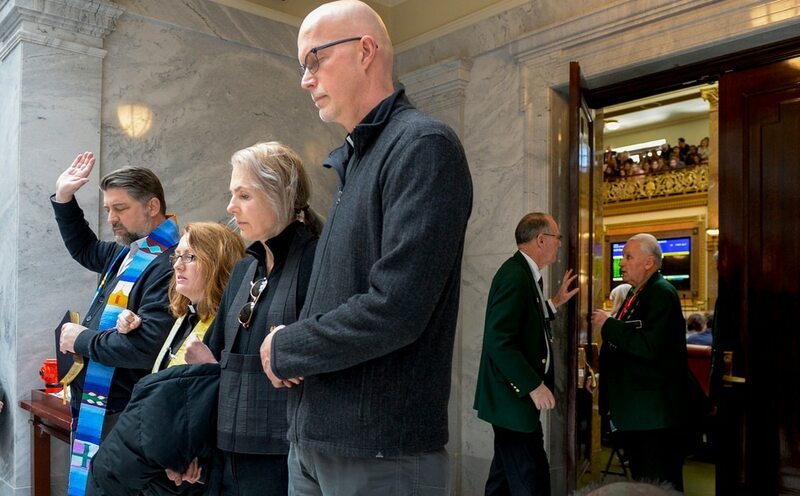 Under the eyes of a capacity crowd, and with protesters inside and outside their chamber, members of the Utah House voted Friday for a partial Medicaid expansion program that would revert to full expansion in the event federal administrators reject the state’s plans. Representatives voted 56-19 for SB96, securing the two-thirds majority required for immediate implementation, and which would prohibit supporters of Utah’s Proposition 3 — a full expansion initiative approved by voters — from overturning the legislation by referendum. All 56 “yes” votes came from Republicans, while three GOP members joined all 16 Democrats in opposition. Friday’s vote bookended two weeks of debate over Utah’s Medicaid program and how the state should proceed in the wake of Prop 3, which earned 53 percent of the vote in November but is forecast by state analysts to run a budget deficit in future years. SB96 had previously earned more than a two-thirds majority in the Utah Senate, again mostly along party lines, but the bill must return there for another vote on the House’s changes. On Friday, Senate President Stuart Adams, R-Layton, was optimistic that senators would quickly give final approval to the bill next week. Critics of the bill made their presence known Friday. During the House proceedings, Speaker Brad Wilson, R-Kaysville, interrupted outbursts in the public gallery and warned that disruptors would be escorted outside. Despite that warning, three demonstrators were later removed from the gallery by Utah Highway Patrol troopers after draping a painted sheet down into the chamber and shouting, “Respect our vote.” Those demonstrators were not arrested, and they relocated to the lobby outside the House chambers, where faith leaders had gathered to kneel in prayer, read scripture and sing patriotic songs while representatives debated SB96. Olyvia Burbidge, a Bountiful resident and one of the protesters removed from the gallery, said she was moved to action by the Legislature’s refusal to respect the results of the November election. Proposition 3 is the second successful 2018 ballot initiative to be targeted for overhaul by lawmakers, who in December voted to enact a negotiated medical marijuana program as a replacement to Utah’s Proposition 2. A third initiative creating an independent redistricting commission — Proposition 4 — is expected to face legal challenges or future legislative roadblocks. Burbidge was critical of SB96, saying lawmakers found a Medicaid solution that works for them but doesn’t work for Utahns. Under Proposition 3, Utahns earning up to 138 percent of the federal poverty level would be allowed to enroll in Medicaid beginning April 1, with the federal government paying 90 percent of the state’s Medicaid costs. But if SB96 is approved by the Senate and signed by Gov. Gary Herbert, Medicaid enrollment would be capped at 100 percent of the federal poverty level, with Washington paying 70 percent of Utah’s costs and the remaining expansion population left to buy subsidized insurance from the Affordable Care Act individual marketplace. The bill seeks a waiver from federal Medicaid administrators to pay the 90 percent cost share for the lower expansion threshold, and appropriates roughly $50 million for an 18-month “bridge” program as replacing Proposition 3 will initially cost the state more money to provide health care coverage to fewer people. Legislative leaders say they’ve been given assurances the waiver will be approved. “They are telling us three days ago, this is going to happen,” Dunnigan said of his conversation with administrators from the federal Centers for Medicare and Medicaid Services. SB96 includes a contingency plan that would expand Medicaid eligibility to 138 percent of poverty if Utah’s proposal is denied. The fallback provisions are largely the work of Rep. Ray Ward, R-Bountiful, a physician who has supported Medicaid expansion and who sponsored competing legislation — HB210 — to implement Proposition 3 with comparably minor tweaks to the initiative’s cost structure. On Friday, Ward spoke in support of SB96, an early indication that the House’s proposed changes were sufficient to win decisive support in the chamber. “We’ll be able to keep the promises that we have made to our constituents,” Ward said. The three House Republicans who joined the chamber’s Democrats in opposing the legislation all represent districts where voters approved Prop 3: Reps. Craig Hall of West Valley City, Steve Eliason of Sandy and Eric Hutchings of Kearns. House Minority Leader Brian King, D-Salt Lake City, suggested that Republicans were using taxpayer dollars to gamble on people’s health care. “We’re requesting a waiver on something that has never been done before, literally, in any other states,” King said. King also pushed back on the characterizations of subsidized insurance on the individual marketplace, saying that low-income individuals who would otherwise have access to Medicaid will be expected to pay premiums, copays and deductibles under SB96. But Daw’s son is just 17, works part time and lives at home, so he has few of the expenses a near-poverty wage adult would face. House Majority Leader Francis Gibson, R-Mapleton, asserted that partisan interests had impeded Utah’s waiver requests under Democratic administrations. The current Republican administration, he said, is more receptive to the state’s desire to shape and manage its Medicaid program. Chase Thomas, executive director of the left-leaving Alliance for a Better Utah, called the vote on SB96 “absolutely shameful” and warned of electoral consequences in a prepared statement. But the Utah Health Policy Project (UHPP), which supported Proposition 3, said there was “some hope” in the revisions made to the bill, as its backup plan now includes full Medicaid expansion. Immediately after the vote on SB96, the House held a moment of silence in recognition of Utahns killed while serving in the military.